@cicii3 Hey work neighbor, do you think you're going to head to Scooper Bowl this week? Maybe we could meet up for an ice cream lunch? For those of you not familiar, the Scooper Bowl is the nations largest all-you-can-eat ice cream festival. 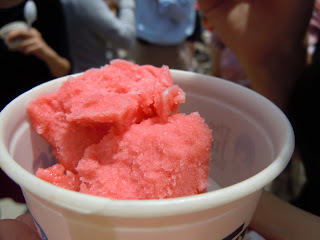 You pay a flat rate for admission ($8 for adults) and are given a spoon and can eat ice-cream to your hearts content. 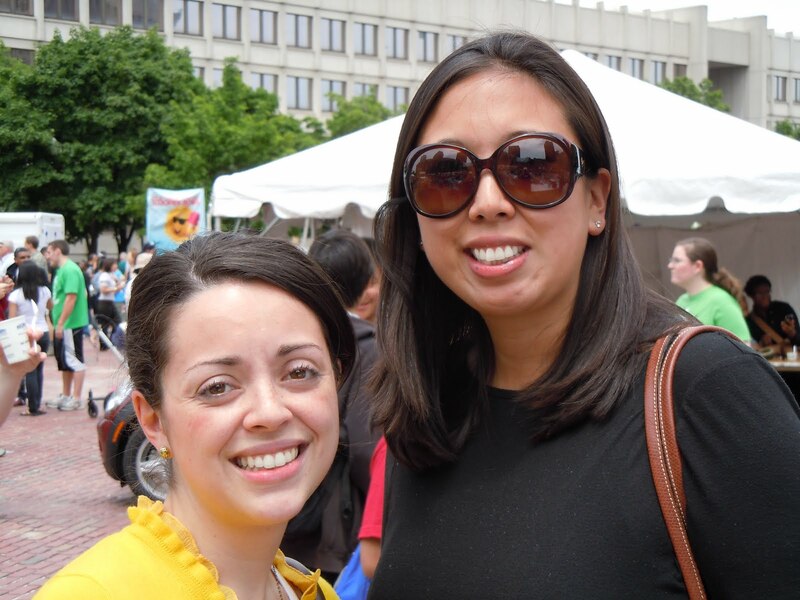 It takes place right in Government Center in Boston, and all proceeds benefit the Jimmy Fund - specifically cancer care and research at Brigham and Women's hospital. 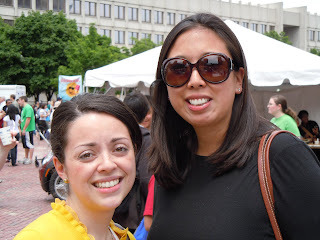 Michelle and I both work a hop, skip, and jump from Government center, so this was a no-brainer! Ice cream for lunch? What a wonderful idea! I immediately accepted and we made plans to meet up on Wednesday at lunchtime. Before I met Michelle, I did a little Scooper Bowl research. I've been to the event before and I know that it can get overwhelming, and you can get full pretty fast. I researched the Ice Cream purveyors who would be participating, and the flavors they would be sampling. This way Michelle and I could prioritize the most important flavors for us to try. Basically I'm a food nerd. 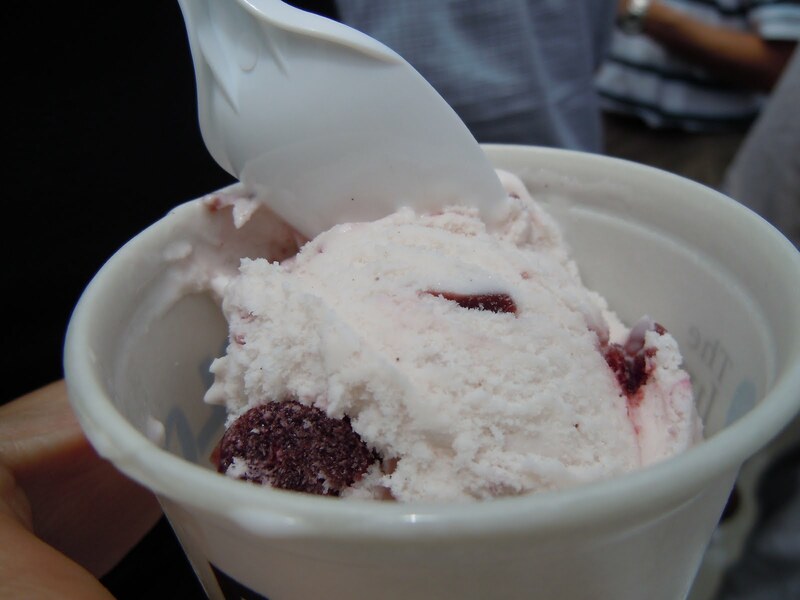 Michelle set priority at anything cherry, and also the blood orange sorbet. I was dying to try the Olympic inspired Ben and Jerry's flavor of Hannah Teter's Maple Blondie, and the Key Lime Graham gelato. We started at Breyer's to satisfy Michelle's cherry vanilla craving. I went with the classic strawberry which I feel is usually a good indicator of a brand's ice-cream promise. We were both happy with our selections. The strawberry tasted like real fruit, and not too cloyingly sweet. 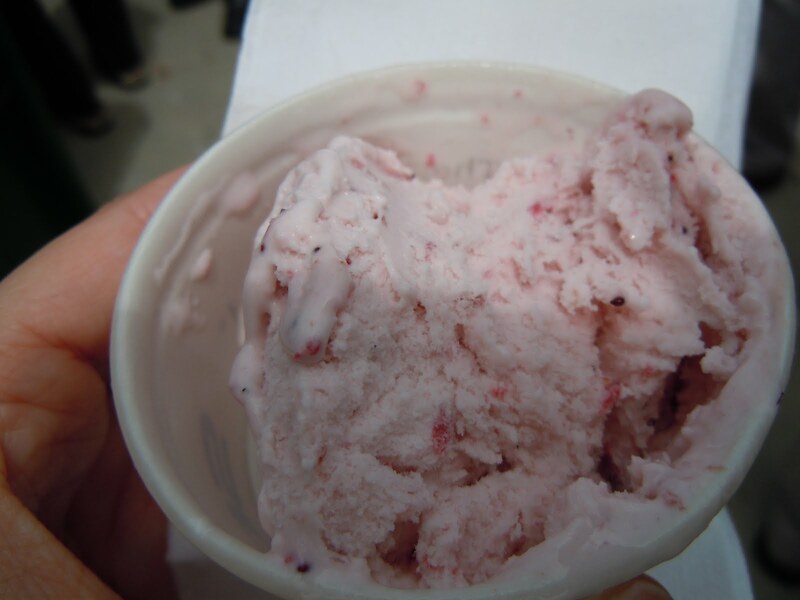 The cherries in Michelle's cherry vanilla were perfectly ripe. The fruit really shined through. 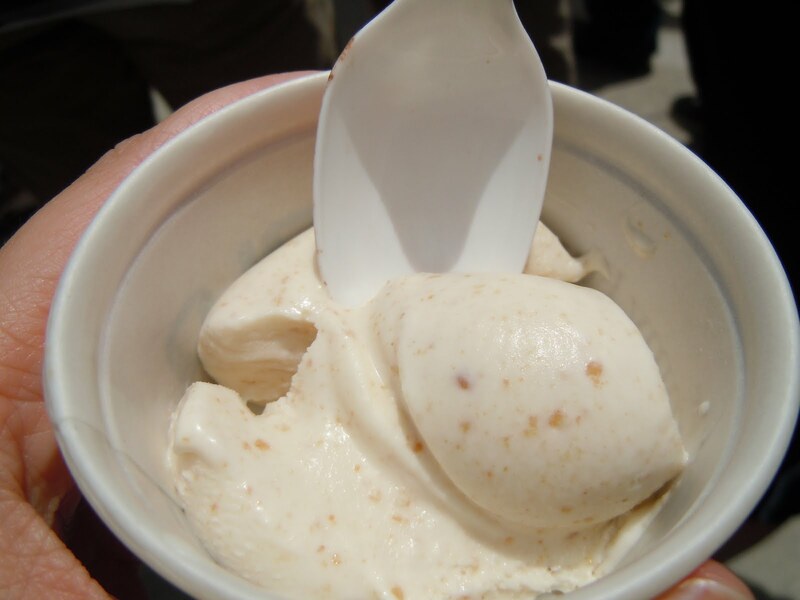 The crunch whirl really made this flavor, I liked the contrast of the creamy ice cream and the crunch. 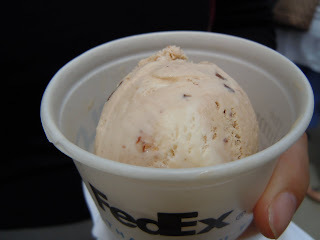 Although this was a vanilla ice cream, it was very rich with chocolate. I don't think I could eat more than a scoop or so in a sitting. Rich Amaretto Ice Cream studded with Cherries and Streaked with a Ribbon of Chocolate. We both agreed that this flavor was a little too sweet (especially after the more natural-tasting Breyer's immediately before). It's such a pretty color though! By the time we hit the Edy's stand, the crowd was really starting to build. There were several field trips and soooo many children. We were starting to get trampled by pre-teens. We forged ahead. My Edy's Maxx was VERY good - especially for someone who holds everything to a Ben and Jerry's chunk standard. This was a chocolate ice cream base with HUGE chunks of chocolate and thick ribbons of peanut butter. This is peanut butter cup ice cream on steroids. Rafe would LOVE this. 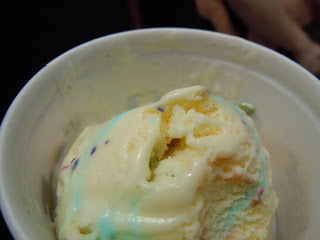 Michelle had the Birthday Cake flavor, and we both agreed that the flavor was spot-on yellow cake. With the sprinkles and colored swirls it reminded me of funfetti. We were both really looking forward to the Ciao Bella Gelato tent. I had never heard of the company before - and I always like finding new brands. I thought their flavors were the most original - and a quick look at their website indicates that these flavors are just the tip of the iceberg. They have flavors like prickly pear and blackberry cabernet. I'm going to be on the lookout for them in stores! I had the Key Lime Graham....I was expecting something super citrusy, but instead this was a nice balance between citrus and the creaminess of the gelato. I loved the flecks of graham cracker. Michelle loved her Blood Orange sorbet. It was flavorful and refreshing. And look at that beautiful color! When I was younger, my grandmother worked for Friendly's Ice Cream....having gallons upon gallons of Friendly's Ice Cream in the freezer, and being forced to eat it all the time takes away some of the charm of an ice cream treat (though I still love the sundae cups). For me, it was a HUGE deal when my mom would buy a container of Ben and Jerry's. We'd have to hide it from Grandma of course, but I loved the really inventive flavors - it was a great treat compared to all that Neapolitan. Or the dreaded Jubilee roll! For me, Ben and Jerry's is usually the one to beat - the guys did not disappoint yesterday either. 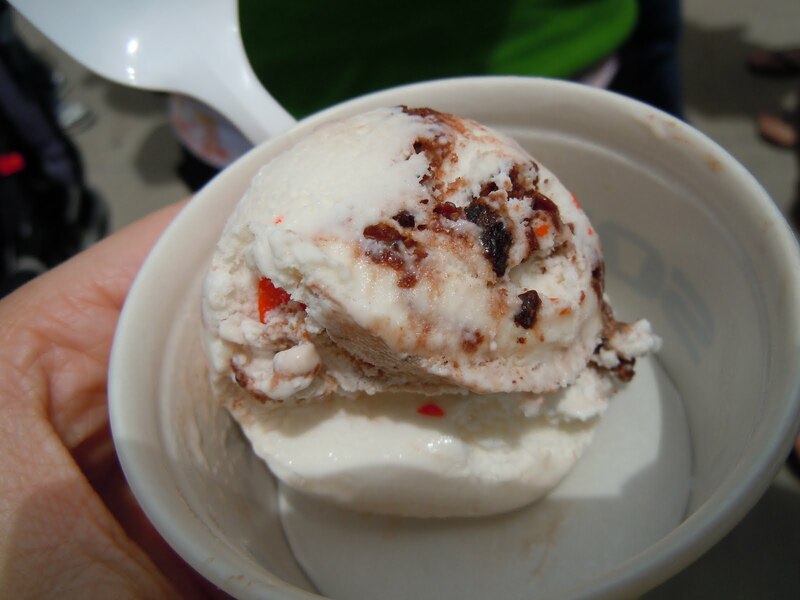 This is a unique flavor in that it is ONLY available at Ben and Jerry's Scoop Shops. 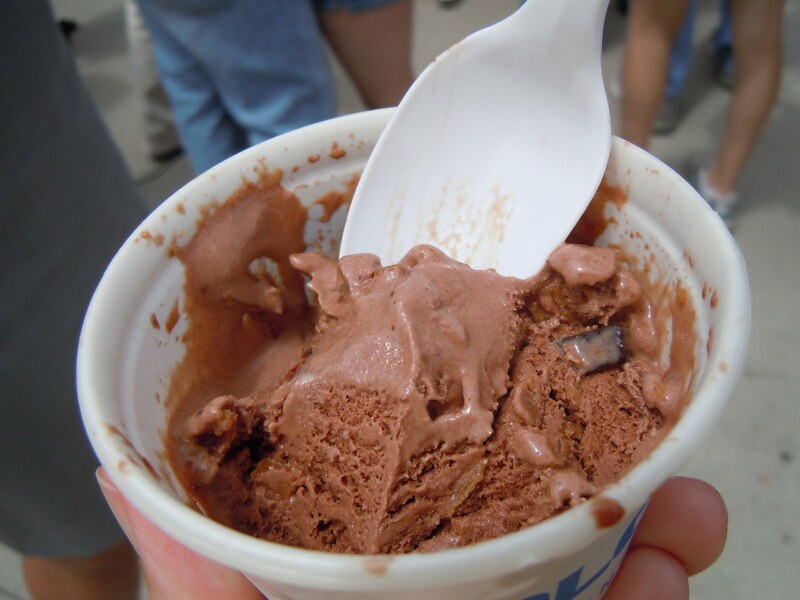 The flavor is a joint venture between the Bonaroo Music festival and Ben and Jerry's. The music festival has pledged to donate their share of the profits to the Bonaroo works fund - community investment and philanthropic endeavors. How about that? Delicious Ice-cream with a side of philanthropy. 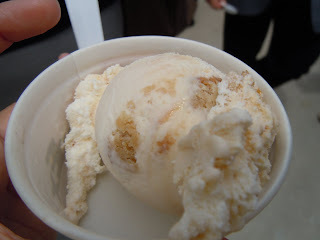 Since the Olympics, I've been dying to try Hannah Teter's Maple Blondie: Maple Ice Cream with Blondie Brownie Chunks & a Maple Caramel Swirl. So good, and huge chunks of blondies, YUM. 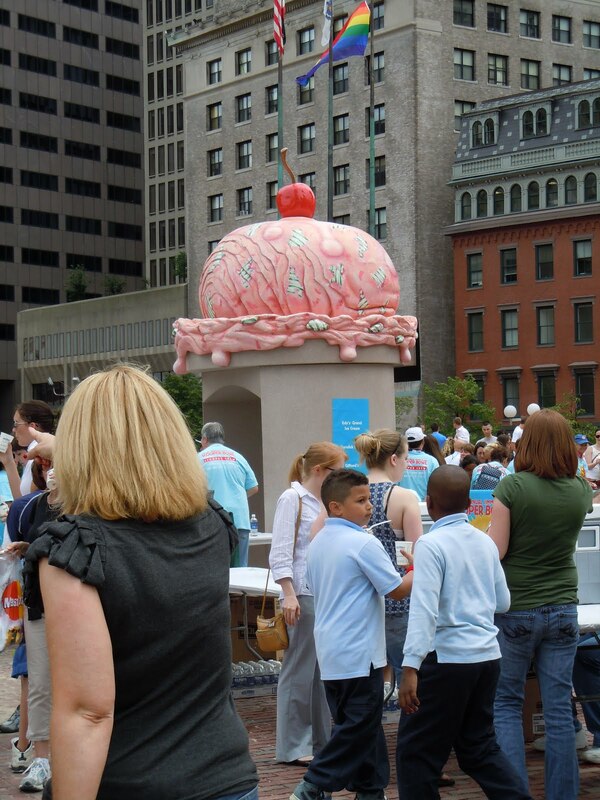 The Scooper bowl is on today - from Noon - 8pm - so try and get down to Government Center. 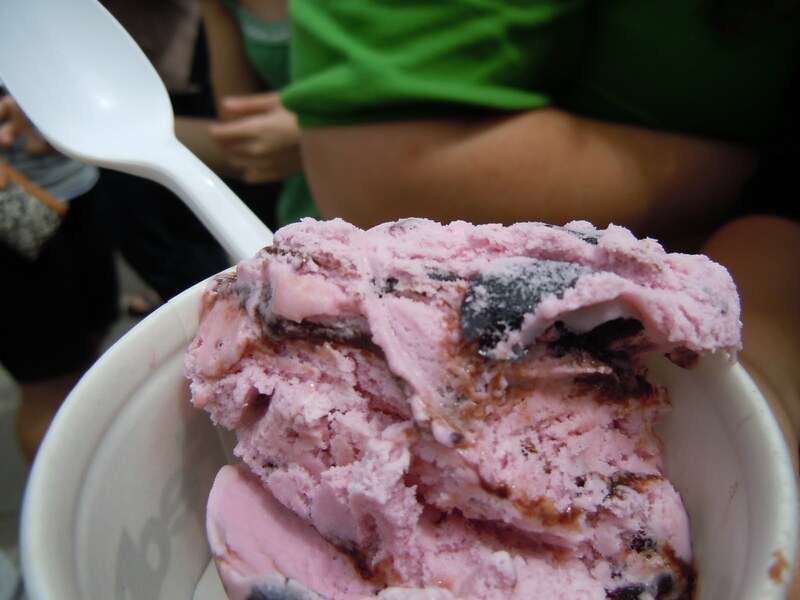 For $8 admission you can eat all the ice cream you'd like. Michelle and I only scratched the surface of the possibilities. Thanks Michelle for inviting me along! This was a great way to spend the lunch hour, and now that we know how close our day jobs are, we definitely have to have some more lunch dates! Yesterday was a lot of fun and I love, love, love that you mapped everything out! Our next lunchtime adventure - Clover Truck? omgosh this looks amazing. seriously, i scrolled through the icecream pictures twice. i'm glad its cold out this morning or else i would have ran out to go buy some!